Public relations involve effective external and internal communication to improve the understanding of court processes and the court’s critical role in preserving the rule of law. The public’s trust and confidence is vital for courts to fulfill their constitutional mandate to safeguard the rights of all. The variety of audiences, messages and delivery methods require court leaders to possess a set of skills to ensure the transparency and accountability expected by the public. 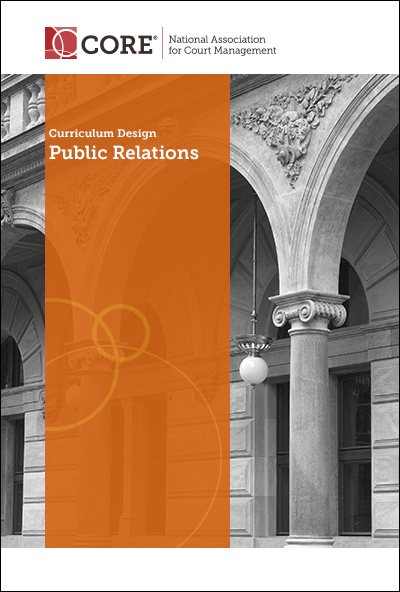 The following learning objectives are designed for a comprehensive course on public relations. Design a publicity campaign demonstrating knowledge of methods of communicating through news media, social media, and public outreach methods. — Socrates (Greek philosopher) circa 400 B.C. A recent public opinion survey, The State of the State Courts, conducted November 14-16, 2016 by the National Center for State Courts (NCSC) found small but consistent gains in confidence in voters’ respective state courts since the original poll in 2012. State courts have consistently inspired more confidence than the executive or legislative branches in each state, and today, nearly 3-in-4 say they have a great deal or some confidence in their state courts. However, the survey also found that those who report direct interaction with the courts give lower ratings on customer service and overall job performance (46 percent excellent/good, 52 percent just fair/poor). Specific to federal courts, there is also a 2015 Gallup poll where the public trust in the judiciary sinks to new low of 53%. While courts remain the most trusted branch of government and public confidence in the courts has grown, public opinions can shift quickly based on external factors or high profile media coverage. The greatest threat to public confidence, based on the survey, was doubts about partisanship and political bias in the selection of judges as well as the decisions they make. The degree to which the judicial branch of government can fulfill its constitutional mandate is based largely on the public’s respect for its authority. The public’s trust and confidence can be inspired by transparency and accountability in court processes and delivery of fair outcomes in addition to the perception of fairness.